Keep Your Yard, Garden, and Flowers Looking Gorgeous with an Expandable Garden Hose with Adjustable Sprayer Head! garden hose, 9-pattern sprayer nozzle, an on/off valve, and extra rubber washers! to kink-free flexibility. It's perfect for pets, cars, plants, gardens, or washing off the desk. Every ExpaHose is backed by unbeatable craftsmanship and trusted customer service. cover any defects or defaults in workmanship. Contact us with any questions. FLEXIBLE, EXPANDABLE VERSATILITY - Lightweight and portable, our expanding garden hose quickly expands from 33ft to 100ft when watering your lawn, garden, or flowers. 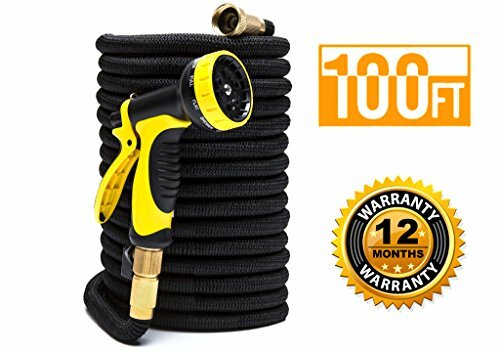 COMPLETE HOME & GARDEN USE - At 100ft in length this garden hose is ideal for watering your flowers, garden, or lawn, and washing your dog, driveway, or vehicle! HIGH-PRESSURE STRENGTH - A triple latex core and heavy-duty brass fittings withstand intense pressure without leaks to help improve efficiency and reduce water waste. INCLUDES 9-PATTERN SPRAYER NOZZLE - Every flexible gardening hose also comes with an adjustable spray gun to let you wash, spray, clean, or shower with a simple click. 12-MONTH WARRANTY - Every ExpaHose is backed by premium craftsmanship and reliable customer service, as well as a 12-month warranty for quality assurance. If you have any questions about this product by ExpaHose, contact us by completing and submitting the form below. If you are looking for a specif part number, please include it with your message.